This is a list of more autumn flowers, which do not have an entry of their own yet. ..... tsumakurenai 爪紅 (つまくれない) "fingernail red"
..... senshisoo 染指草 【(せんしそう) "dye finger plant"
. mizuhiki no hana 水引の花 (みずひきのはな) . The roots and rhizome are used for Chinese medicine. Also called "kyuukyuu" きゅうきゅう in some regions. A perennial herb of the bellflower family.
. aobana and Yuzen 友禅 dyeing . Porophyllum japonicum. of the chrysanthemum family. It has been introduced from China and used as a medicine since the Edo period. This is a very simple flower and many haiku express a kind of solitude and down-to-earth living. inokozuchi 牛膝 (いのこずち) "ox knees"
Its root is used as a Chinese medicine for snake bites. four o'clock flower. lit. "white face-powder flower"
..... yuugeshoo 夕化粧 (ゆうげしょう). lit. 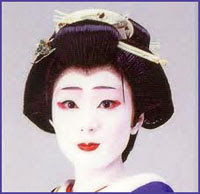 "evening make-up"
oshiroi is also the name of a white make-up, often used by Geisha.